Pork loin roast, fried apples and sweet potatoes – a classic dinner. It is very simple, calling for only basic cooking skills, but looks fantastic and like you spent hours in the kitchen. My kind of cooking! Start with a crockpot that has been sprayed well with cooking oil or lined with a cooking bag. I put about a half cup of hot water from the superhot tap into the bottom to provide moistness and help heat the crockpot quickly. You can brown the pork loin in a skillet to deepen the flavor, but I often do not take the time. There may be a bit of fat on the loin. Pork has a tendency to be dry so don’t give in to the temptation to trim it because it will add moistness to the meat. Mix together the brown sugar, salt, pepper, mustard with enough orange juice to make a thick paste. Pat a bit on the sides and spread the rest on the top of the meat. Place meat in the crockpot and drizzle with about a tablespoon of olive oil, being careful not to “wash” off the sugar rub. If you are going to leave the house for the day, use a larger pork loin, be sure you add enough water to cover the bottom at least ¼ inch deep and cook on low. I generally use smaller roasts so it cooks for a shorter time (around 4 hours) and someone is around who can check an hour or so before eating time to make any adjustments needed. If you want to check the internal temperature, federal guidelines have changed to a lower temperature than they used to recommend – 140 degrees vs 160 degrees. Let the meat rest on its platter outside the crockpot while you fry the apples. Fried apples – never heard of ‘em until college. I come by my minimal preparation criteria honestly, you understand. With six kids, my mother was not one to add unnecessary steps or dishes to wash. You want an apple – pick it up and eat it. But fried apples are almost the equivalent of no extra preparation. Put about a tablespoon of butter into a small frying pan for every two apples, wash and slice the apples into the pan. Heat over medium heat, stirring occasionally until apples start to turn limp but are still crisp to bite — if that makes sense! Don’t let them get mushy in other words! It will take 5-10 minutes, depending on the variety of apple. Sprinkle lightly with cinnamon and serve. Add a vegetable and/or a salad. Perfect meal for the family or for guests! Prepare crockpot with cooking spray or liner. Add water to cover bottom at least ¼ inch deep. Brown first one side and then the other of pork loin in skillet with 2-3 tablespoons of oil. This is an optional step, but does deepen the flavor. Mix dry ingredients and orange juice to make paste. Pat on sides and spread most of it on top. Place pork loin into crock pot and drizzle with olive or canola oil. Cook on low 8-9 hours for roast 4 pounds and up or 4-6 hours for less than 4 pounds. Internal temperature should reach 140 degrees at least. Let rest for 10 minutes before serving. Scrub and trim, then cut into uniform chunks. Smaller ones cook faster. Place in medium pan and cover with water. Bring to boil and boil for 15 minutes, until sweet potato pierces easily with fork. Whip with mixer and season with salt and butter to taste. Cook 5-10 minutes, stirring occasionally until slightly limp. Don’t miss a thing! Subscribe to get new posts by email, follow on facebook, twitter or by RSS. If you see something you like, use the Pin button on the top or one of those cute little share buttons down below! I read the first three things on your post and thought yes, yes & yes, please! Looks delish! We love all of these things, but I can honestly say we’ve never prepared them together! I think we’ve missed out because of it too! I’m going to remedy that soon! Thanks for sharing at the Rock ‘N Share! Charlene, can you come to my home and cook for us? This sounds amazing! Thanks for sharing with my group! This is an awesome meal with some of my favorties, sweet potatoes and fried apples, it doesn’t get any better than this. Thank you so much for sharing with Full Plate Thursday. Hope you have a great week end and come back soon! This looks yummy! 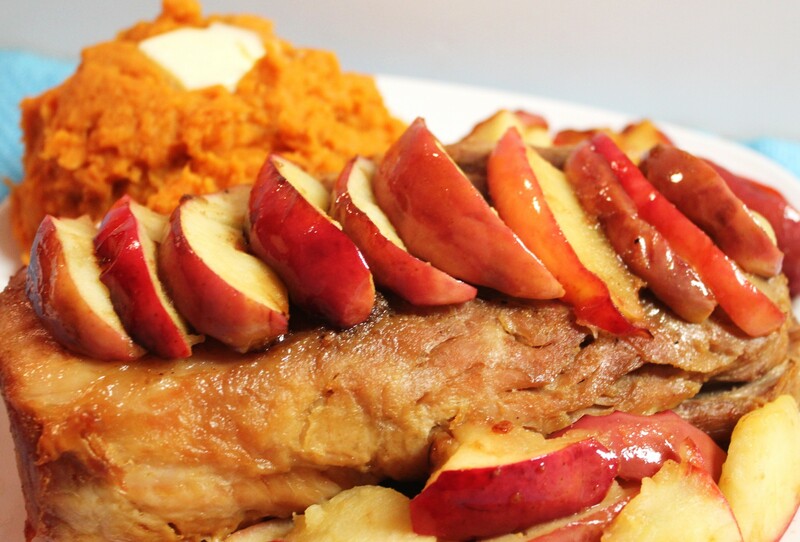 I love pork and apples together, it’s such a great combination! Thanks for the recipe! I love easy-to-make recipes and I think I can easily tweak this a little to meet our dietary restrictions (We’re Paleo). Looks delicious! I’m trying to do more crockpot dinners since they can be so easy!!! Pinning this to try (hopefully) soon!!! I’m a new follower from the make my morning blog hop!